Taking a good shower is likely part of your morning ritual to wake up and get ready for the day. A cold or weak shower stream can ruin an otherwise pleasant experience. It may be time for you to replace your shower head. Choosing the best low flow shower head means you have to think about several factors, which we’ll outline below. Not only does your showerhead have to give you good performance, but it has to do so in compliance with EPA guidelines. We have a list of the best shower heads for low water pressure. Hopefully, this informs you in making a decision. Here we’ve tried to give some basic information on each product. This model from Moen has a magnetic attachment for the handheld portion, so it’s easy for you to place it where you need. Unlike many of the models on this list, this shower head offers multiple spray options and strengths. You can have a gentle massage, an oscillating massage, a pulsing spray, or a standard stream. You also get combinations and a pause option. The Moen shower head is WaterSense certified, meaning that it saves water and heat energy without sacrificing comfort. The shower head is 3.5 inches wide, so it can easily fit on the wall or the ceiling. Some heads that are too wide are difficult to fit on a wall mount. The Sava fixed mount showerhead has a low water throughput, which is suitable for people who want a gentler shower experience. It pushes 1.5 gallons per minute. The shower head fits on a swivel ball joint that makes it easy to move in all directions and direct the stream where you need it to go. It offers even coverage for the most efficient and comfortable shower possible. The shower head is made of ABS plastic with a chrome finish, making it look great in any decor. If you’re especially conscious of your water usage, give the LDR 502 a try. 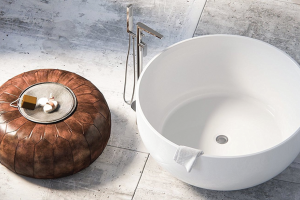 It is equipped with special water saving technology controlled by a push-button design. No more fiddly switches or dials. The maximum water flow is 2.5 gpm, but the controls allow you to almost completely stop it if necessary. It doesn’t completely shut off; this is a safety measure designed to prevent a sudden waterfall of scalding water. You only get one flow setting, but it’s still convenient for low flow areas. 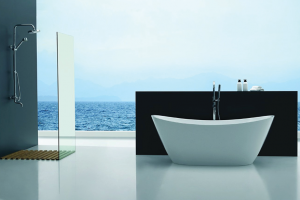 Want to feel like you’re getting a strong shower even without having strong water pressure? Try the High Sierras model. Even though this showerhead has a maximum throughput of 1.5 gallons per minute, the compact nozzle design provides you with thick, powerful streams of water that can make you feel like you’re at a spa. 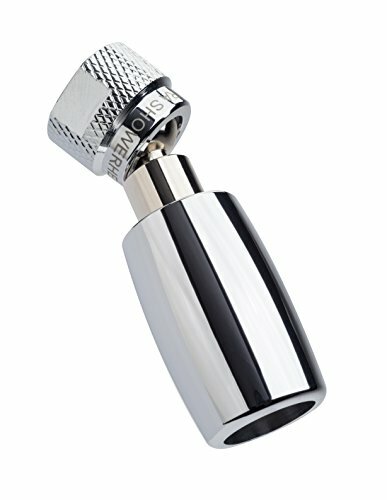 If you don’t have a powerful flow, you can narrow the opening to compensate, which is exactly what this shower head does. 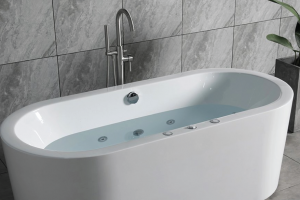 It’s designed specifically to save water and energy and is rated to save up to 40% on both. Your actual results may vary depending on where you are and your shower habits. 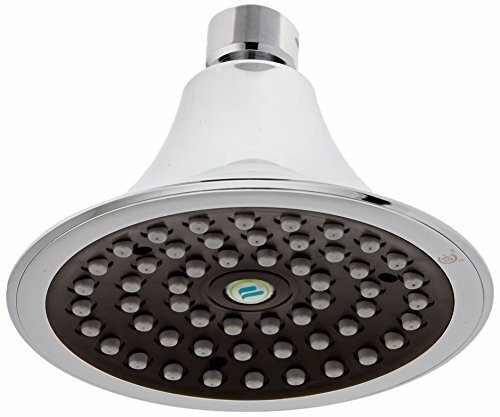 The Niagara Earth Massage shower head has many of the same properties as the High Sierras model. One critical difference is that it has a detachable hose to aid in increasing mobility. The hose extends to 72 inches so that it can reach just about anywhere in a standard shower. 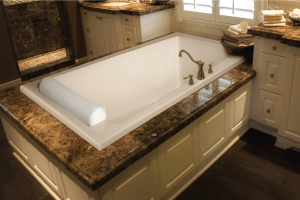 The Niagara model does not aerate its water, so it loses less temperature and doesn’t have to be heated. However, the lack of aeration means you’ll have to stand closer to get the same spray strength you would otherwise. This is a little more in-depth look at each of the low-flow shower heads we found in our research. 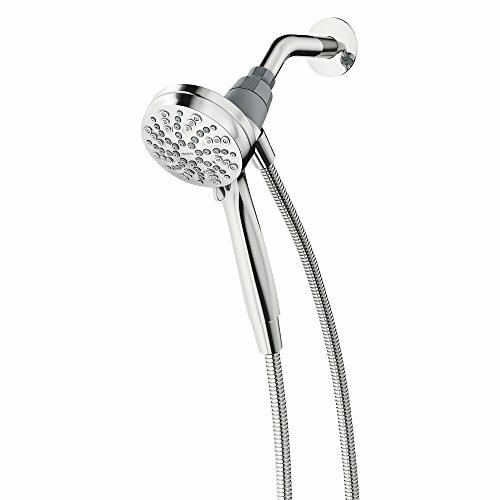 Moen has always been known for quality water fixtures, and this shower head is no exception. In fact, it stands out from others on our list because of its versatility. Other low flow shower heads seem to provide only one basic stream. The Moen offers six setting, similar to its high-pressure brethren. Massages, gentle rains, power streams, and various combinations are available. 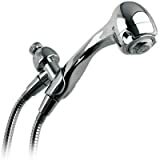 You get a basic shower head and a detachable hose that adheres with a powerful magnet. If you’re on a tight budget, you might want to skip this one; it can cost over $40. Otherwise, keep it in mind. The Sava model has a lower throughput for water pressure than you might want, but remember that it is designed for low pressure. The 1.5 gpm figure doesn’t sound impressive, but in practice, most customers find it effective. The Sava is a workhorse model. Nothing flashy or elaborate; it just gets the job done. The shower head sends water out in a strong, steady flow. 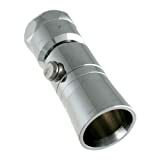 We also like the reliability of the ball joint connecting the head to the main part of the unit. Some customers may prefer a model with more bells and whistles, and we can agree. Most of the shower heads we looked at were multifunctional. Even though the Sava has low water pressure, the narrowed profile makes it seem like there is more pressure. You can expect to pay $10-20. For what you get, it’s a decent deal. The LDR 502 has a bit of an old-fashioned appearance, which goes great with a vintage bathroom setup. Even if you’re going for a modern look, this shower head can still bring a notable accent to the area. This is a slightly higher-pressure model than the Sava. It reaches the maximum throughput of 2.5 gpm. If you live somewhere, that has a small water heater, carefully consider the length of your showers. Like the Sava, this shower head does not provide other functions. The main feature of this shower head is water-saving technology. Sometimes, you may need to stop your shower without completely turning off the water. The simple press of a button engages a special valve inside the shower head, slowing flow to a trickle. Pressing it again resumes regular flow. There is no in-between. This shower head tends to list for less than $20, giving you an even higher pressure and shower quality than the Sava, in our opinion. The High Sierras shower head provides 1.5 gpm of water throughput, but you could easily be fooled into thinking it was more. The nozzles, specially designed to take advantage of lower water pressure, are narrow enough to compensate. They are mounted in a swivel, giving you a full 360-degree range of motion. Another thing we like about this shower head is its resistance to clogging. It does this because it is made of specially treated metal. Hard water deposits can lead to clogs in your shower, causing it to not work as well. 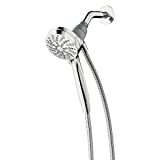 This shower head from Niagara distinguishes itself from its competitors by packaging a handheld hose with the main unit. 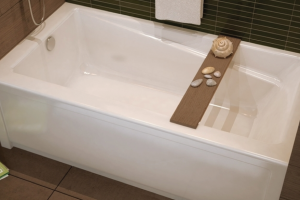 Mobility is a huge advantage when picking bathroom accessories. The extendable 72-inch hose is nothing to pass up. You can also know that you’re getting a pure stream of warm water, even if it’s lower pressure. Looking for a good shower head for low-pressure water means that you may have to make sacrifices in certain areas. As with everything in life, there are trade-offs, so we’ll tell you about the different properties of shower heads so you can make an informed decision. Water pressure works by having a constant amount of water adjacent to a faucet, spigot, or for our purposes the shower head. A shower head increases the apparent pressure by narrowing the individual openings through which water flows. Given the same amount of water, it will flow faster and have more momentum through a narrower opening than through a wider one. The measurement for a shower head’s capacity is gallons per minute, or gpm for short. The highest legal amount for sale since the EPA instituted water-saving measures in the early 1990s is 2.5 gpm. You can, however, get around this by removing the water restrictor in some shower heads. Doing this will add to your water bill. Like many aspects of your bathroom, you should consider the appearance of your prospective shower head and how it fits with your existing decor. You might want a stainless steel or chrome look if you have a more modern or minimalist aesthetic. The only problem is that metal can rust if you don’t take care of it. Plastic, on the other hand, doesn’t rust. It’s also relatively lightweight. Unfortunately, it doesn’t look that great in a lot of settings. It is cheaper, so if appearance and cost aren’t your primary concerns, you can get by with a plastic shower head. The first thing you need to find out is whether your shower head attaches to the wall or the ceiling. Each has its own set of pros and cons, but unless you feel like rerouting your entire plumbing schematic, you don’t have much choice when buying one. We’ve tried to review a mixture of wall and ceiling models. How accessible is your new shower head? Is it long enough to reach comfortably if you or other people aren’t tall? If not, is there a removable nozzle or extendable arm for easy adjustment? Some heads have a dial for changing settings, and you need to have access to this. Accessibility is also a concern for people with mobility issues. Sometimes, you want something different in your shower experience. Maybe you want a massage-like shower, the gentle feel of rain, or pulsing jets that rotate. If you have multiple people in your home, they may also want to customize the experience. Check to determine whether your shower head provides different options. Because you’re dealing with a low-pressure stream of water, it isn’t going to be as easy for it to come from the shower head to you. Therefore, the water has to be aerated; this involves a stream of air being injected into the water to increase the pressure. Although this makes for a steadier shower, it decreases the temperature of hot water. Air in your house is at room temperature. Hot water coming from your shower head is about 20 to 30 degrees hotter. Unfortunately, the laws of physics make that lovely heat get dissipated into the air stream from your shower and the surrounding air. In the three-foot distance, that temperature can drop by a noticeable and unpleasant amount. By the same token, if you choose to have a non-aerated shower head, you then may have to deal with a sputtering water stream and stand closer. As you might imagine, doing this makes taking a shower less comfortable. For our pick, we have to go with the Moen. It has far more functions than the other models on our list, and that alone gives it an edge. It has just as much water pressure as others. We hope our best low flow shower head reviews have helped you choose a new fixture for your bathroom.